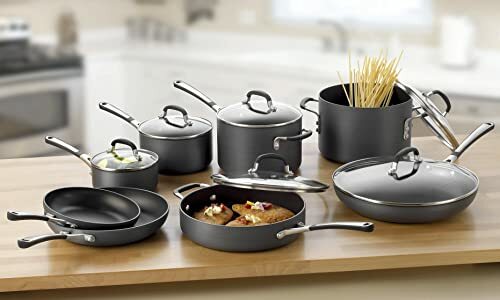 In this article, we take a look at some of the best nonstick cookware sets available on the market today and tell you all that you need to know! Cleaning the dishes is something everyone avoids, and the dishwasher is not always the ideal solution. I try to avoid it as much as possible, but in the end, I’m always the one who ends up doing it. My daughters won’t touch them, and my husband only does it when I make him. It can be easy sometimes, sure, but sometimes you just have to scrape something for ten minutes with a brush, and there’s no getting around it. Except there is – and the way forward is nonstick cookware. Back in the day it was difficult to find, and it didn’t work well, which gave it a bad reputation, but these days it’s almost a must. It makes cooking much easier, and the cleanup becomes a breeze. 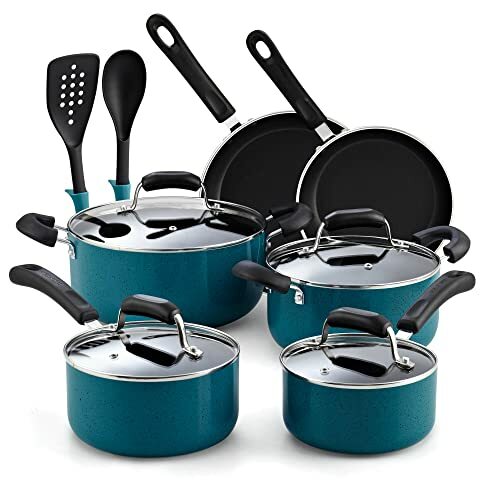 Today I’ll give you a little guide through my experiences with nonstick cookware and tell you all about the best nonstick cookware sets that I could find! What’s so Special About Nonstick Cookware? You’ve probably heard about nonstick cookware before as well as most of the claims about what it does – but what exactly makes it different? Well, in this case, it’s what’s on the outside that counts. The cooking surface is coated with a material that has a low-friction-coefficient – Teflon being the most famous one – which allows food to brown without sticking to the surface. The benefits of this are obvious. It allows you to flip your food easily at all times, take it out in seconds when it’s done and clean up your cookware with ease. Now, despite everything that’s great about nonstick cookware, there are also some downsides to using it. For starters, using metal utensils with it is, in most cases, not advisable since it will damage the nonstick layer on the surface. There’s some nonstick cookware that’s resistant to it, but it’s rare. If you want to avoid damaging your nonstick cookware, getting a silicone spatula is one of the best ways to ensure it stays safe! Here are our reviews for some of the best ones to help you choose. Also, most nonstick cookware isn’t dishwasher safe – again, it will damage the nonstick layer. It’s quite fragile, which is why most nonstick cookware only lasts a few years. Finally, if you like your food on the crispy side, you might be disappointed since some food doesn’t brown that well in a nonstick pot or pan. The first thing you need to consider is the materials that the cookware is made out of. The materials used for the body should heat rather quickly, and aluminum is one of the best things around, though stainless steel also has its benefits. It all depends on how you want your food to be cooked. The bottom also needs to be thick enough, so it doesn’t warp at high temperatures. Still, it shouldn’t be too thick – it won’t heat up quickly enough if that’s the case. Don’t neglect the handle though! Cheap plastic handles are bad, and they’ll warp under more intense temperatures, especially if you put them in the oven. Steel handles coated with rubber or thick plastic are usually the best. You’ll also want the lids of the pot to be made from a transparent material and have an insulated handle, possibly coated in rubber or silicon. That way you can easily check on the food without losing any temperature. When you’re buying a set of cookware, you want to know exactly what you’re getting, and you want to get all the essentials. A good set should have at least two pans – a deep and a shallow one. It should also contain at least 3 to 4 pots of different sizes, and at least one of them should be a tall pot. Stockpots are usually not included in sets like this, but you’ll probably need one sooner or later. Here are some of our thoughts on the best ones we could find. Those are the essentials, and everything else are basically extras – but if they’re good, the do increase the value of the set. Getting a ladle, a spatula or other similar kitchenware is always a great bonus. Sets like these will probably contain wooden or plastic cooking implements since they won’t damage the coating. More is not always better though – if a set contains a lot of stuff you don’t need, you might want to reconsider and get a more affordable, smaller set instead. As with any type of cookware, size matters. If your pots and pans are the wrong sizes, you might be limited in what you can do with them. Some think that bigger is always better when it comes to cookware and, like with most things, it isn’t. You need to have the proper size for the task at hand – otherwise, you’re probably wasting time and energy. If you’re mostly cooking for yourself, having a lot of large pans and pots will just be a waste, and it will slow you down. On the other hand, if you’re cooking for a large family, you want something big. 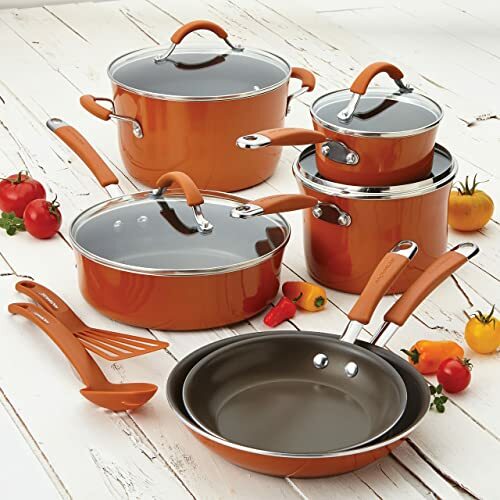 However, I think that having a wide variety of pot and pan sizes in a set is always good and you should aim for that. That way you can make whatever you like in them instead of being limited to a few dishes. Since nonstick coating is quite sensitive, there are a lot of precautions that need to be taken with nonstick cookware. Because of that, some pots or pans will have limited uses. Most nonstick cookware is not dishwasher safe, for example, but rarely, some are, and that could be of use to you. There’s also some nonstick cookware that’s not oven safe or that can’t be put in the microwave because of the materials used to make the coating. Others can’t be used with specific types of stoves, like glass top stoves for example. Glass top stoves are sensitive, so it’s best if you get the right cookware for them. If you’re in doubt, we’ll help you choose the right stuff. If you have some specific uses for your nonstick cookware in mind, check what it’s compatible with before buying it. The first thing you might notice about this cookware set is the striking look it has! The colors are vibrant and just pop out at you. However, it’s not just a good looker – it’s also highly functional. I hate it when I get burned just trying to check how the soup’s doing, and this set gets rid of that issue. All the handles are insulated and covered in rubber, making it easy to lift the lid and not burn your hand. The lids are also made out of transparent glass, so you can check on your food without needing to touch anything. The nonstick coating works great, and nothing seems to stick to any of the pots or pans so far. 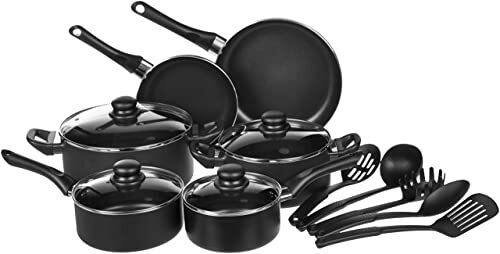 All the important sizes and cookware types are included – you get 2 saucepans, a Dutch oven, 2 skillets, and a cookie pan. The utensils you get with the set are a bit flimsy and worse than the rest of it, but they’re not what you bought this for. Besides that, the entire set is not dishwasher safe, but that’s to be expected. For a 16-piece set, the price here is just a steal! However, that brings up some concerns about the quality of this set, some of which are possibly justified. You do get a lot of useful stuff in this set, including a mini frypan, two open frypans, two saucepans, a stockpot, sauté pan and a steamer. You also get a total of 4 kitchen utensils with that. One of the best things about the set is that it’s all dishwasher safe – something that’s not the case with most nonstick cookware sets. The entire set is also completely oven safe, at least on lower temperatures. Even though it’s made mostly out of aluminum coated with ceramic, it’s not too resistant to high temperatures. The handles are especially shoddy and not properly insulated. The nonstick coating holds up though and works well. It’s a shame that it doesn’t last too long and peels off easily. You get what you pay for in the end. This is another affordable cookware set that comes with a lot of pieces. This includes a casserole pan, a dutch oven, two fry pans, and two saucepans. You also get a nylon spatula and spoon. For the most part, it’s safe to use with almost anything. It’s only not compatible with induction stoves and can’t be put into the oven. The handles are good and lined with rubber so they don’t get hot and won’t break or warp that easily. The lids are made from glass, so you can look at your food, and they have inbuilt steam vents – always a good feature. The lids are also interchangeable and can fit on the pans as well. While the nonstick coating works, it seems to wear out rather fast, which is a shame since the set is great in most other regards. This is an ugly-looking set, at least in my opinion. It’s not a deal breaker, but I do like my cookware to be fancy and colorful, and this is not it. You get a lot of stuff in this set though, including two saucepans, two omelet pans, a stockpot, a sauté pan and a saucepan. It’s all made from hard anodized aluminum. However, it’s all quite thin, so it does tend to heat up fast. The handles are made to stay cool, silicone coated with a steel base. The lids are good, made from see-through glass and some are interchangeable. You get no utensils in the set, but maybe that’s for the better – you get more pots and pans. The set isn’t dishwasher safe, so that’s a minus. It’s also heavily overpriced for what you get, unfortunately. Otherwise, it would be quite decent. If you’re looking for an extremely budget-friendly set, this is it – 15 pieces for a price that’s as low as you can go. However, that’s not the only thing it has going for it. The handles on the cookware are well-made and isolated, so they don’t heat up – something that’s rare with cookware this cheap. The nonstick coating also works well and doesn’t break down after a few months. The body of the cookware is made from aluminum, and it holds up decently. Just make sure you don’t drop it since it’s not too thick. It dents quite easily. It’s not a dishwasher-safe set either, so you’ll need to watch out when washing them. They’re also not oven safe since the handles might melt. They also might not be too safe – they let off quite a rancid smell when heated up too much. I’m not sure what’s happening, but it’s not nice. The entire set is also a bit on the smaller side. If you’re looking to cook for a lot of people, it’s not for you. It’s a good set for a single person who’s just starting out. If you’re getting a nonstick cookware set for your kitchen and you’re married with two kids, it’s much more different than if you’re getting it when you’re just moving out of your parent’s house. That’s why my pick might not be the right one for you – just a fair warning. 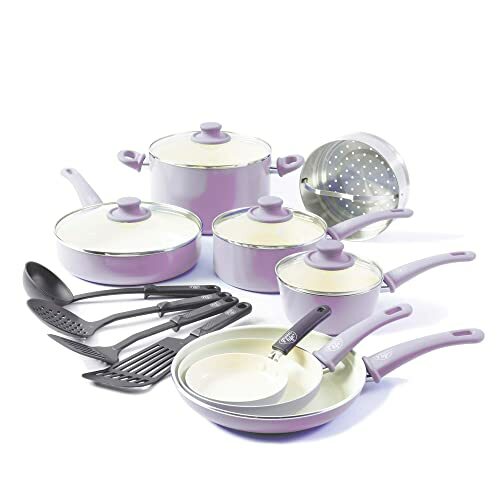 With that said, my top pick has to be the Rachael Ray Cucina Hard Porcelain Enamel Nonstick Cookware Set. It looks great, does the job and has a fair price point while being as durable as some more expensive sets are. It’s a great cookware set no matter how you slice it, and it’s the best one as far as I’m concerned. You don’t have to agree with me though and if you don’t, sound off in the comments. You can also ask any questions you want, and I’ll answer them as soon as possible!